This month we welcome Greg Leitich Smith to our interview series. 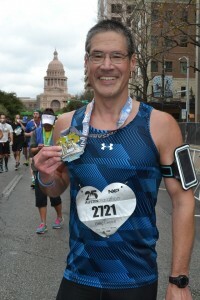 His thoughts on writing, community, and the value of running 26.2 miles are inspiring, and his dedication is admirable. He is both a prolific writer and a regular at SCBWI meetings and events-we are so happy he's joined us here. I grew up in Chicago in a north side neighborhood called Ravenswood Manor and attended a selective admissions magnet high school. 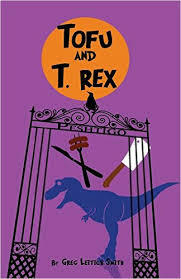 My first two novels, set around the fictional (and academically rigorous) Peshtigo School of Chicago (NINJAS, PIRANHAS, AND GALILEO and TOFU AND T.REX), are inspired by some of my grade school and high school experiences. When I was growing up, it was a solidly middle class urban (and diverse, although no one called it that back then) neighborhood that you do not often see reflected in children’s literature. I tend to be very much a place writer and I think with that also comes a sense of the sensibility of the inhabitants, which may be why it took me twenty years to write a novel set in central Texas (CHRONAL ENGINE and BORROWED TIME). And even then, most of those occur seventy million years ago and most of the native Texans are dinosaurs (literally). 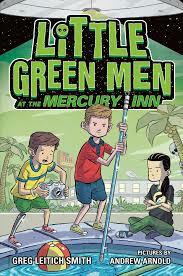 One of my more recent novels, LITTLE GREEN MEN AT THE MERCURY INN, is the story of three friends at a motel in Cocoa Beach and what happens the day after a space shuttle launch is scrubbed due to the presence of a UFO over Cape Canaveral. The Mercury Inn is based in part on a motel my family would stay in during childhood vacations. And a highlight was the space shuttle launches. We never did see UFOs, though. It usually involves me waking up at around 6:00 or so (give or take a half hour depending on whether the cats decide they want to be fed), having a couple of mugs of coffee, and writing. I’ve been trying to do a thousand new words a day and find I am best able to accomplish that first thing in the morning. After that, I’ll work out (some combination of weights, running, swimming, and biking). I’ve gotten back into running marathons and want to do triathlons again, after about a twenty year hiatus. Afterwards, I’ll come home and make lunch, tend to emails, and anything else that needs to be done administratively. Then, I will do any revising or research (for both fiction and nonfiction), as well as prepare presentations for teaching and workshops and school visits. Sometimes this involves going to a coffee shop and writing with friends who are also writers. If I am trapped by a cat, I may take a nap. After dinner, unless I’m on deadline, I will relax by watching television or reading. Sometimes both. In both cases, too, I think it’s important to get a community of like-minded friends together. Both activities have goals that are ultimately individual and personal, but having compatriots can often help when you just don’t feel like getting out of bed to go run or open up that computer and start typing. 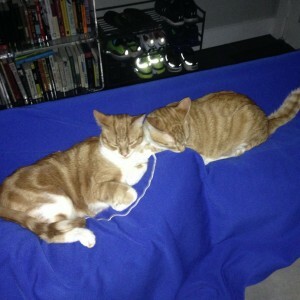 Also, cats are helpful. Unless they step on your keyboard. I am very happy to be a member of a supportive writing community here in Austin. I think we’ve built something here that’s very special and that we all should be proud of. Also, there’s still a thrill at being published by houses whose books I read and loved as a kid…:-). 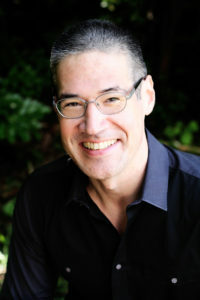 BIO: Greg Leitich Smith is an award-winning author, born and raised in Chicago and now residing in Austin. His middle-grade books include Little Green Men at the Mercury Inn; Chronal Engine; Ninjas, Piranhas, and Galileo; and Tofu and T.Rex. 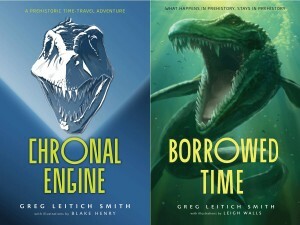 His most recent novel for middle-grade readers is Borrowed Time, a sequel to Chronal Engine. Greg and Cynthia Leitich Smith are the co-authors of the picture book, Santa Knows, illustrated by Steve Bjorkman and the short story “The Wrath of Dawn,” in the anthology Geektastic, edited by Holly Black and Cecil Castelluci. Greg’s novels are characterized by their humor, adventure, and reflect his background in science and engineering. He is of German and Japanese descent, and many of his characters are similarly mixed-race. 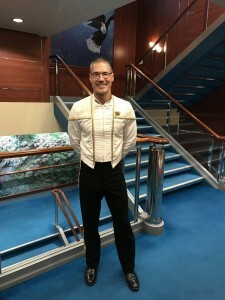 Greg holds degrees in electrical engineering from the University of Illinois at Urbana-Champaign and the University of Texas at Austin. In addition, he holds a degree in law from The University of Michigan Law School, Ann Arbor.